This garden is an extension of an architect designed and newly renovated Victorian house, for a professional couple living in SE central London. The garden is over-looked on three sides and its aspect is almost true North/South enabling prairie style planting. It is ±5m wide x ± 14m long. New interior finishes include polished concrete floors that extend through bi-fold glass doors from the cooking/dining area. Inside brick walls are an ochre colour textured face. Exterior walls are recycled London stocks. 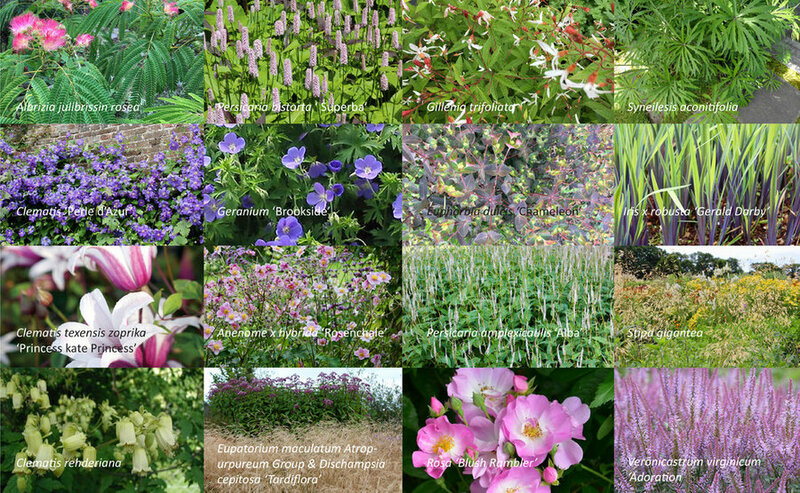 In style, an English country cottage garden has been prescribed by the client: Floriferous with bee friendly, fragrant planting; climbing roses, jasmine and sweet peas plus a vegetable ‘patch’. The mystery and enchantment will be found in the Victorian inspired planting scheme for this garden. 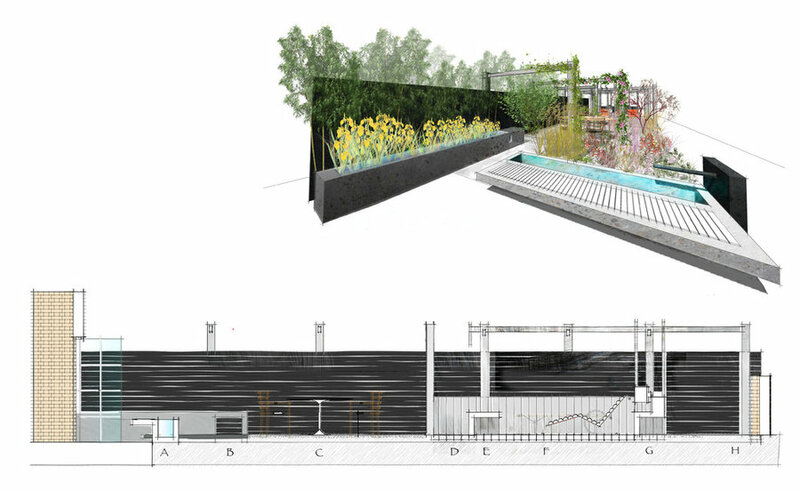 The planting design will be more contemporary in translation, but identifiable to plant style with a hint of urban meadow. The garden will invite exploration and be an escape. It will have a long seasonal interest from early crocus, to late grass colour and seedpod textures. This garden will demarcate the seasons just as the countryside does. 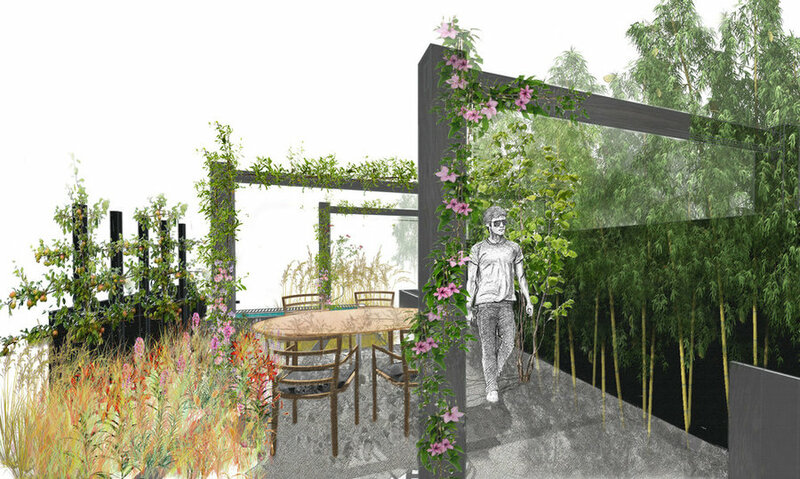 Its bounty will be fruit, vegetables, cutting flowers and herbs for its owners; with friendly food for pollinators, a place for bird song: A place of refuge. 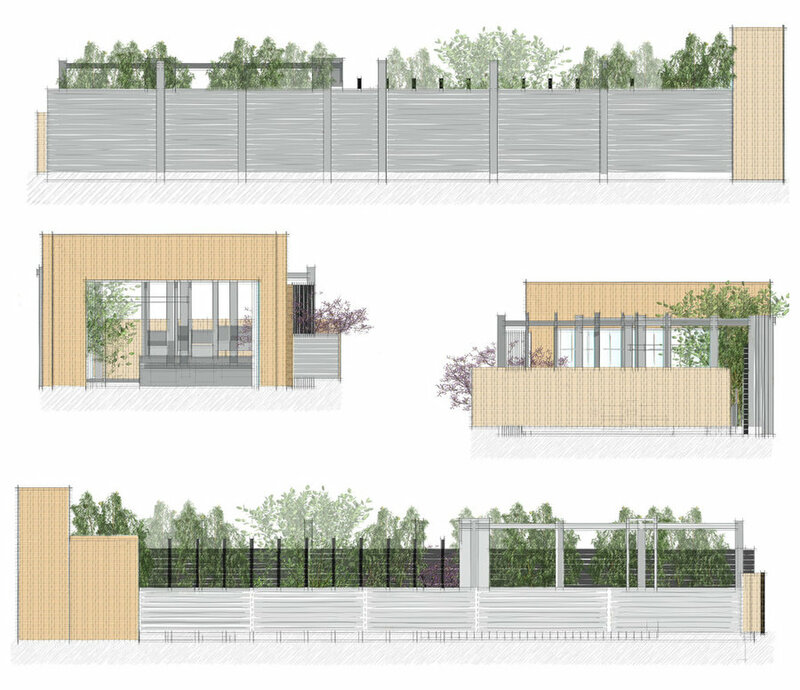 Because the garden is long and narrow, the destination walkway-loggia has been created to visually widen that space. It will be a place to linger (close to the kitchen) for alfresco breakfasts, coffee or continental style supper evenings. One will feel at the epicentre of the planting, surrounded by perfumed English style climbers. Drawing/design ©Jane Finlay. The water feature A fits in neatly as a way to demarcate the kitchen/dining guest overflow area from the perennial meadow style planting that is to be the source of nectar for bees. Its finish echoes the polished concrete found inside and it doubles as a bench for entertainment indoor/outdoor conversations. The back of the dual-purpose shed has storage underneath for wood G or boxes E; room for tools to hang behind vertical herb planting boxes (visualised empty to show structure). Drawing/design ©Jane Finlay. 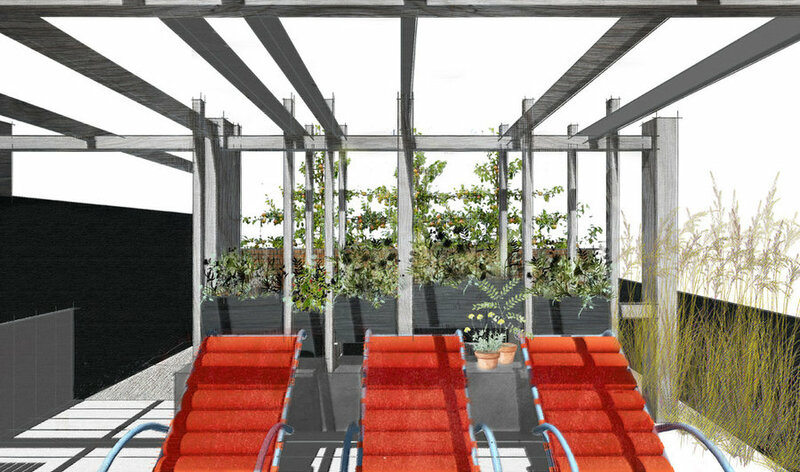 These loungers face the window-seat shown earlier, and behind are the vertical herb boxes. To the left the decking wraps up to frame the bamboo screening (not shown); at the back, espalier fruit trees give privacy on the boundary. The dual purpose shed will, of course, be draped in climbers (not shown, to illustrate structure). Drawing/design ©Jane Finlay. A pergola was top of the landscaping 'must haves' list; its been interpreted as a multi-purpose garden shed. It is situated almost garden centre. This window seat is adjacent to the planting with a view over it to give a sense of a country hide-away. Drawing/design Jane Finlay. 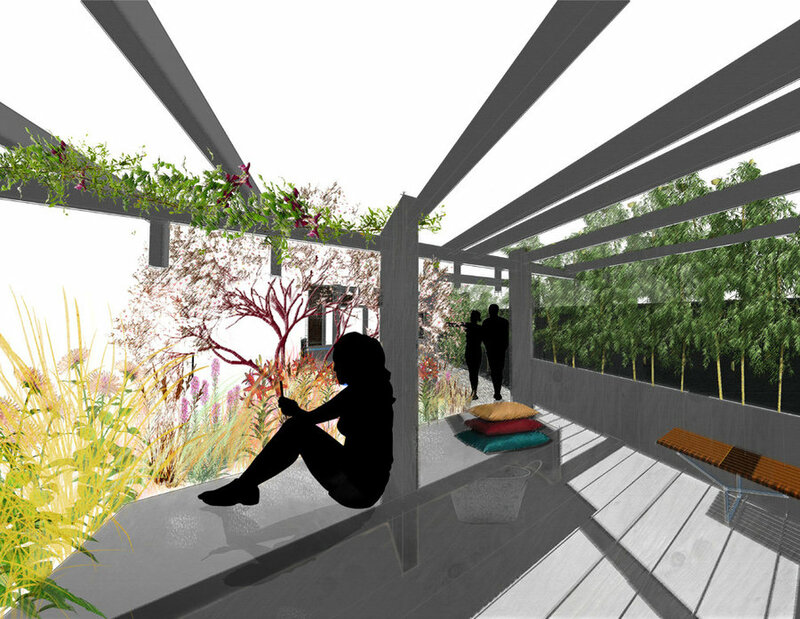 Apart from the client wish list, light and shadow consideration, as indicated on the Masterplan, has played a vital role in the design of this garden to optimise both recreational and plant growing spaces. 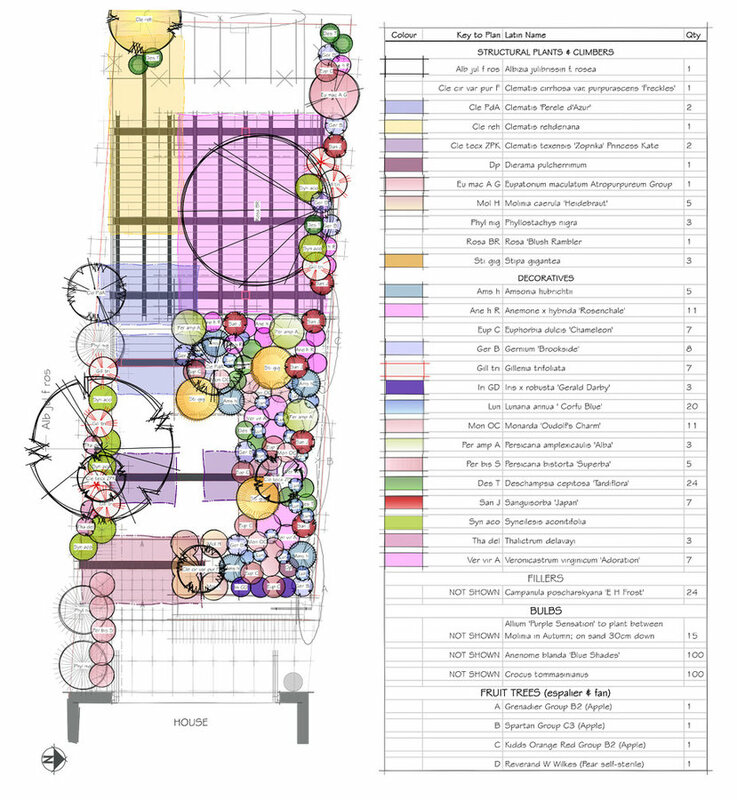 See also, the Planting Plan. Drawing/design ©Jane Finlay.